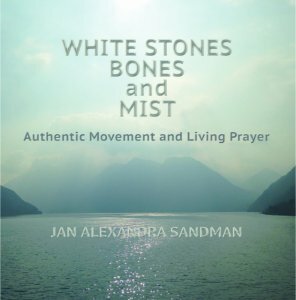 White Stones, Bones, and Mist: Authentic Movement and Living Prayer by Jan Sandman, describes the practice and process of Authentic Movement. The form and practice of this healing modality accesses the intrinsic wisdom of the body and fosters deep trust in its innate knowing, which often predates conscious memory. This awareness is collective and universal as well as personal, connected as we all are in an invisible golden web. White Stones, Bones, and Mist would be of practical interest for anyone interested in the connection between mind, body and spirit for support in developing a more authentic and intuitive way of living. Anyone who is engaged in embodiment practices of any kind, in consciousness and spiritual development would find themselves in these pages. The book is both detailed in its description of the form and expansive in an outward sweep of what happens when the intelligence and consciousness of the body is given a real place at the table. The book is part photographic essay using beautiful images taken during an actual movement session to ground the description and explanation of the nuances of the form. As I read this book, I was transported to a different state of consciousness through the clarity and luscious descriptions of the author’s experience of authentic movement, and the incredible wisdom she clearly embodies. I felt my mind come to peace, and my body to ease as I read the book little by little over several weeks. I found it so packed with visceral information that I couldn’t have read it any faster. It is a complete immersion experience to read this book. I was so immersed that I had vivid dreams where I directly experienced the healing energy of the author and woke up feeling clear, refreshed, and moved. I would recommend this book to anyone wanting a visceral, real experience of what it means to embody oneself with authenticity. Rarely is a nonfiction book so comprehensively inspired and inspiring. White Stones, Bones, and Mist touches all the senses and shows a way to integrate body, mind and emotions around an awakened inner essence/ spiritual core. Picture and prose gently spiral around you, making you more whole, more in touch with your own deepest self. How is this possible when the book is ostensibly a memoir, a description of a single session of an unfamiliar movement practice, and a picture book of vibrant colors, swirling forms, masked figures, and odd poses? 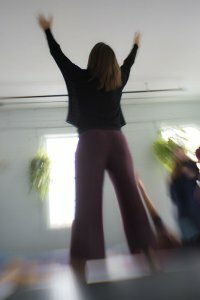 Jan Sandman’s description of the Authentic Movement practice gives the reader the opportunity to understand and virtually participate in the experience. It is a way to access one own rhythms, and natural path, a way to access support and inner guidance, a way to return from deep places knowing how to use and integrate what you have found. She writes with wisdom about many aspects of a journey that is unique for each of us: creating conscious patterns, choosing what feels right rather what feels merely happy, holding inner stillness, following the inner threads, finding helpers in the unseen worlds. Jan reveals herself in these pages in many aspects: lyrical writer, penetrating observer, grief traveler, pancake maker, mother/sister/daughter, healer, artist, visionary, and quiet, wise guide. The photographs are informative, perfectly matched with text, beautifully printed and stunning—the ones of the colored silks used in the session are so vibrant and alive it is hard to resist the urge to taste them. There are several threads in this book that can be taken separately as themes but are woven together. My favorites were several short personal narratives that described the origins of the author’s healing impulse and orientation from her own subjective awareness and family context; clear and unique descriptions of aspects of Authentic Movement that both practitioners and non-practitioners would find useful, including the development of the “inner witness,” tracking one’s experience, and her thoughts on the ceremonial nature of the form and its relationship to other forms of ceremony; and her unique and passionately described exploration of the subtle energies of colors. Sign up to receive new articles from Jan delivered directly to your email. © 2013-2016 Jan Sandman. All Rights Reserved.